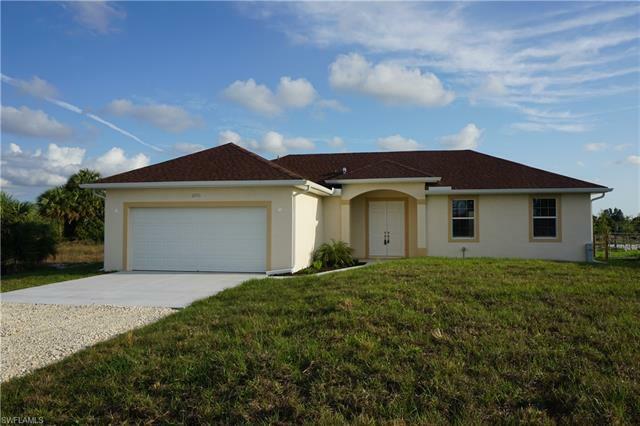 NEW CONSTRUCTION SPECIAL in Golden Gate Estates!Situated in a 1.14 acre lot and more importantly, a lightly trafficked dead end road, which offers more peace and quiet along with safety for kids. Many interior and exterior upgrades such as: 1. Concrete driveway2. Aluminum soffit 3 . Gutters 4. Porcelain Tile 5. Wood self cabinets throughout 6. Granite counter tops 7. Stainless Steel Appliances 8.Baseboards and trimming throughout 9. High performance water softener system 10 . Garage door opener wall based, etc. The distinguished Master bedroom and spacious Master bath feature a walk in closet, walk-in shower, tub and dual sinks. Home features two car garage and laundry room in residence. Lanai overlooking landscape area with lots of room for pets, horses and a pool. Sprinkler system. This is a wonderful area of Golden Gate Estates and well worth the look! Priced to sell!! !